NEW ORLEANS – Record-book altering marks shook up the newest NCAA Division III Women’s Indoor Track & Field National Team Computer Rankings that were released Tuesday by the U.S. Track & Field and Cross Country Coaches Association (USTFCCCA). Four of the teams that were in the top-5 in Week 2 returned in Week 3: No. 1 Williams, No. 2 Oberlin, No. 3 MIT and No. 4 Ithaca (up from No. 5). Ohio Northern joined the top-5 for the second time this season and the third time in program history after Emily Richards shined at the Camel City Elite. Richards clocked the third fastest time in NCAA DIII history over 800 meters (2:07.46) and took over the top spot of that NCAA DIII Descending Order List. That gives Richards three top marks this season – the 800, the mile and the 3000. UMass Boston jumped two spots from No. 8 to No. 6 thanks to Wadeline Jonathas. The sophomore broke the NCAA DIII record for the 60-meter dash when she crossed the finish line in 7.43 this past weekend. The previous record of 7.49 was set by Nia Joyner in 2016. Just last week, Jonathas broke the NCAA DIII record for the 400 with her time of 53.70. Further down in the rankings, Wartburg and Loras joined the top-15 and both can attribute that rise to strong relay efforts. The Knights went from No. 17 to No. 12 following a sterling outing by their distance medley relay, which is now ranked fourth on the Descending Order List. The Duhawks feature the fifth-ranked 4×400 relay on the Descending Order List (3:57.11). You can’t talk about 4×400 relay teams without mentioning Nebraska Wesleyan. The Prairie Wolves clocked the nation’s fastest time this past weekend (3:49.21) and jumped 24 spots from Week 2 to Week 3 because of it. NWU is now ranked 16th, its first time in the top-20 since Week 3 of last year. We’re just about one month away from the 2018 NCAA Division III Indoor Track & Field Championships in Birmingham, Alabama. 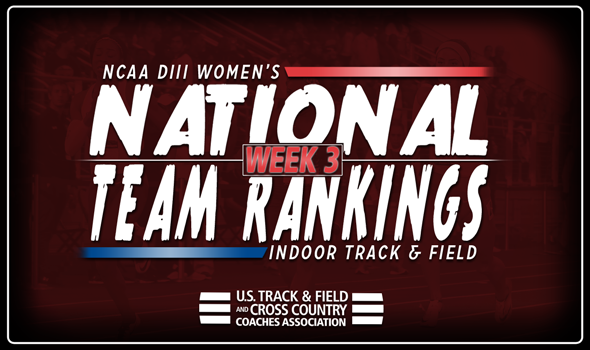 Be sure to check back weekly as we’ll bring you updated looks at the National Team Computer Rankings.